Algae spores are present in the atmosphere constantly. Algae are primitive plants that behave like bacteria and propagate by division and algae spores. Algae contain chlorophyll and emit oxygen, it is present in suspension and forms film, growing and spreading to turn the pool green. Rain is a main factor in carrying these spores down into pool water, and encouraging them to grow. Algae growth is accelerated when phosphate and nitrate content is high which is the case for a fish pond. Direct sunlight is also a key factor that speed up the growth of algae. Algae in a fountain or pond without creatures are easy to be removed. Chlorine dosing or algaecide are two of the typical solutions. HydroFLOW P Range is an ideal solution to remove algae in a reliable, cost effective and environmental friendly way. 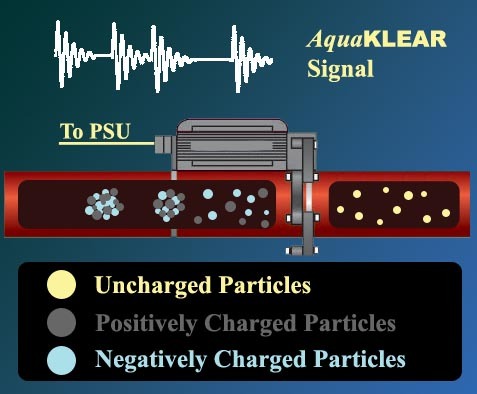 Suspended particles including algae spores and nutrient substances are polarized when they pass through the induced electric field. Polarized particles are held together to form a large flock which can be filtered out from the water by means of ordinary sand filter. When algae spores and nutrient substances are removed from the water, existing algae grown on the surface of wall or basin will turn brown due to nutrient deficiency. Water becomes clear when floating algae and suspended substances are removed. HydroFLOW P Range can be installed in any places where algae problem is your concern. Fountains, fish ponds and cooling towers are typical examples. Flocculated substances are then removed by sand filter which is commonly incorporated in a circulation system. There are many factors governing the success of agae removal by HydroFLOW P Range The following criteria are essential to maximize the performance.